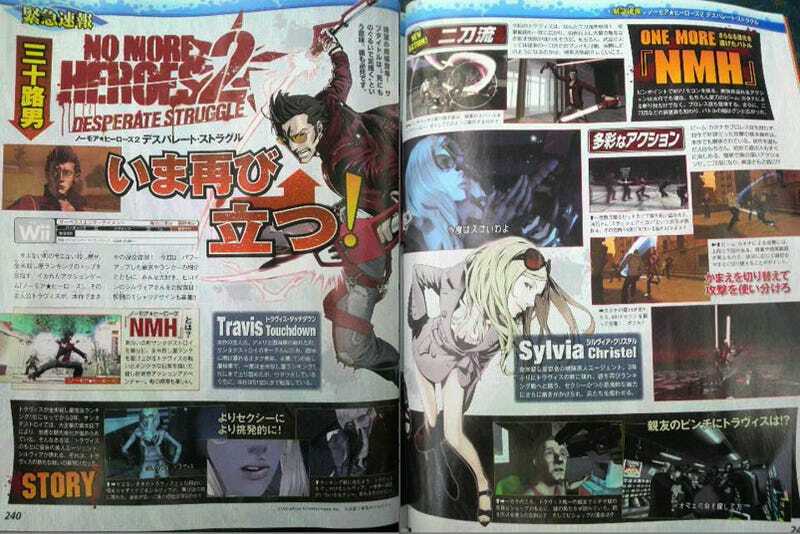 More No More Heroes 2: Desperate Struggle info. The game got an oh-so-brief teaser announce at last year's Tokyo Game Show. This week's Famitsu adds a few more details. The game once again stars beam katana assassin Travis Touchdown and Japanese Ukrainian co-hort Sylvia Christel. There's a new character — a hip-hop killer named Nathan Copeland who is ranked 50th by the United Assassins Association. He carries a shape-shifting boom box. In Desperate Struggle, Travis learns the art of dual beam katana wielding. Details are currently scant about how this translates into gameplay. Expect more details at E3 — hopefully! Oh. One more thing. The game's developer, Grasshopper Manufacturer, appears to be taking applications for in-game t-shirt designs.